Khisrav was not yet 12 when a landmine explosion took his sight. In 1993, Khisrav and his family were displaced for several weeks because of conflict in the countryside near his home. Shortly after they returned to the village he and his friends found an unexploded device in the pasture. The boys put it in the fire, and debris from the explosion caught his eyes, blinding him. The delegation visited several government and nongovernmental organizations (NGOs) in Dushanbe to conduct a victim assistance needs assessment, and traveled to the Rasht Valley, one of the most heavily mined areas in Tajikistan, to meet with various NGO’s and medical facilities that provide support to landmine survivors within the region. Members of the delegation had special expertise in physical rehabilitation, particularly in prosthetics, wheelchairs and victim assistance program design and implementation. In August 2016, the Polus Center conducted a follow up visit to Tajikistan’s National Mine Action Center (TNMAC) to support Victim Assistance services. During this visit the Polus Center provided direct assistance to survivors and training in prosthetic fabrication and wheelchair fitting. Wheelchairs were provided to the regional hospital in Gharm. At the National Prosthetic and Orthotic Center in Dushanbe Polus provided several patients with new prosthetic devices and offered training to the prosthetic technicians. Dr. Reykhan Muminova translates for Dave Evans during a prosthetic fitting where trainees observed. One of the survivors who was visited in Gharm had badly worn prosthetic legs. 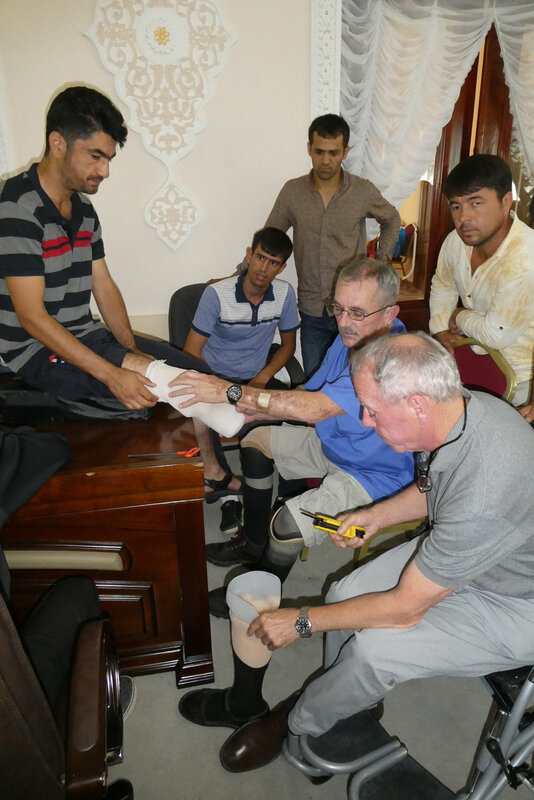 He was transported the following day to Dushanbe to be evaluated by Certified Prosthetist, Dave Evans. As a result of the overwhelming number of patients at the National Prosthetic & Orthotic Center needing new prosthetic limbs, Evans stayed on an additional week to be able to provide this patient with new limbs. 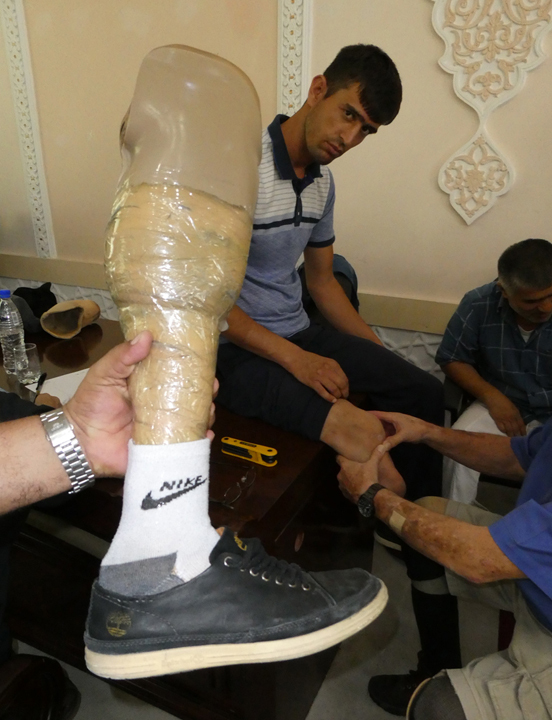 The overall quality of prosthetic devices for landmine survivors in Tajikistan is very poor. Most survivors who have suffered limb loss need new limbs. Many of them have gone to great lengths to repair their devices as best they can, often using tape or glue to simply hold them together. Continued use of ill-fitting devices can lead to serious medical complications including infection, gangrene and stump deformity. Several survivors padded sockets that no longer fit with additional cotton socks or cloth towels. Poor alignment, modifications and socket design all contributed to less than optimal mobility. Dave Evans fits a landmine survivor for new prosthetic limbs. Poorly fitted limbs also resulted in pressure sores, poor circulation and discoloration of distal end of amputations. .
Operation Mercy, a Swedish NGO, provided the Polus Center with wheelchairs that the Polus Center distributed to the Regional Hospital in Gharm. The Director of the regional hospital was very appreciative of the wheelchairs and the training provided by Santiago Castellon. It is recommended that continued wheelchair training, especially training in seating and seating construction, should be a priority. Wheelchair training at the Regional Hospital in Gharm. There are a limited number of quality wheelchairs in the various medical facilities that the Polus Center visited and patients were not properly fitted. Poorly fitted wheelchairs can result in serious medical conditions and may even be life threatening. It is recommended that the distribution of quality wheelchairs throughout Tajikistan continue. Vocational training that reflects public/private partnership with on-the-job (OJT) training, or apprenticeship programs, are much preferred over facility-based programs. Facility-based programs require significant operating costs for building upkeep and staffing and do not guarantee future employment. TNMAC’s Victim Assistance Coordinator Alisho Shomahmadov, signing a small grant contract with a landmine victim in the Rasht Valley. The majority of landmine survivors who were interviewed were very interested in learning new job skills to improve family income levels. The survivors in the Rasht Valley appear highly motivated and creative and very capable of developing new job skills. A program that first assesses future job skill demand, and then designs vocational training congruent with those demands, is a sound strategy toward creating sustainable VA services. Each summer, TNMAC’s provides an opportunity for landmine survivors and people with disabilities to gather and to participate in a “Summer Workshop”. In 2017 the workshop took place at a sanatorium retreat in Khujand, Tajikistan, where individuals could relax and participate in a variety of recreational and disability related workshops. The event was divided into two segments with program participants attending lectures or workshops each morning and receiving a variety of medical/rehabilitative services in the afternoon. Executive Director of the Polus Center, Michael Lundquist conducted a lecture series on integrative strategies and person centered approaches to assistance. The lecture series conducted by Michael Lundquist gave ample opportunity for attendees to ask questions and address victim assistance/disability issues that were most relevant to their situation. This interactive lecture series was well received by participants. It began by establishing demographics. Understanding types of disabilities, where people lived and prioritizing their concerns helped to focus discussions on what people were most concerned about. Discussions centered on the importance of Disabled Persons Organizations (DPOs), the importance of leadership development and the limitations of human rights legislation in the context of the day to day struggles for people with disabilities. Polus Center prosthetic/orthotic and wheelchair subject matter experts, Certified Prosthetist Dave Evans and World Health Organization trained Wheelchair Technician Santiago Castellon, provided training presentations as well as hands on direct assistance to persons using prosthetic limbs and/or wheelchairs. Dave Evans, evaluates a landmine survivors residual limb. He will return to Tajikistan in January 2018 to provide new prosthetic limbs to landmine victims who participated in the Bohriston Workshop in Kujand. 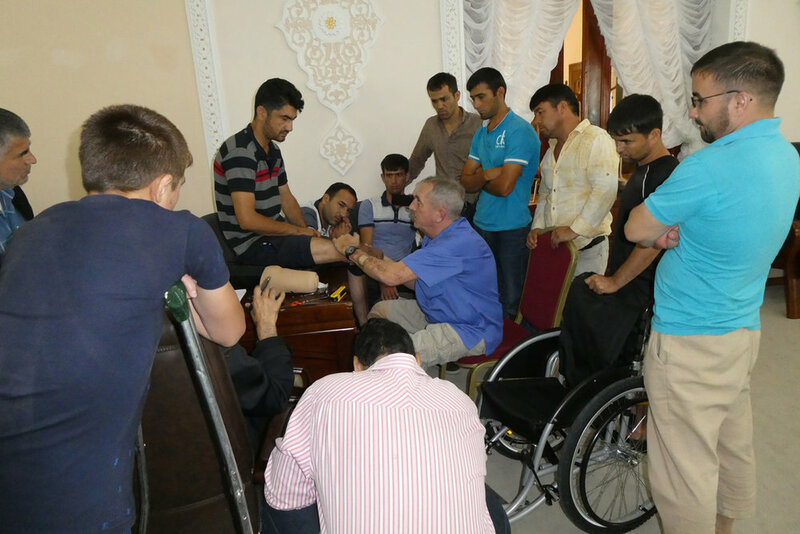 Landmine survivors who attend the Summer Workshop and needed new prosthesis were scheduled for an appointment at the National Prosthetic and Orthotic Center in Dushanbe. The Polus Center ordered prosthetic components and materials so that each individual will receive a quality prosthetic limb. The prosthetic workshops taught end users how to care and maintain prosthetic limbs, and a skilled Prosthetist recommended when individual landmine survivors needed a new prosthetic device. Dave Evans, worked closely with Tajik staff at the National Center to ensure the fabrication was a well-fitted, high quality prosthetic limb. Polus Center disemminated end user prosthetic care manuals to all workshop participants with limb loss and to rehabilitation staff interested in prosthetic limb care. Wheelchair Technician, Santiago Castellon, discussed wheelchair quality and fitting. Theory and practice were combined to keep participants engaged and to offer a comprehensive layperson’s understanding of wheelchair design and usage. Similarly, wheelchair training covered a wide range of topics such as the importance of cushioning and proper maintenance and repair. The Polus Center provided new wheelchairs for landmine survivors who attend the Summer Workshop through Operation Mercy, a Swedish NGO who agreed to set aside ten wheelchairs for the Polus Center. Several new wheelchairs were used for demonstration during the training workshops. The Rough Rider wheelchairs that were used for demonstration purposes at the Summer Workshop were given to the workshop participants who were clearly happy to receive them. Additional wheelchairs will be sent to the National Rehab Center in Dushanbe when Polus Center returns in 2018 for follow up prosthetic fabrication and training. Like the prosthetic program, the wheelchair trainer evaluated the fitting and appropriateness of wheelchairs which were being used by landmine survivors. First-time wheelchair users were afforded the opportunity to try wheelchairs that have been properly fitted during the workshop sessions. Practical demonstrations were given on how to measure, fit and care for wheelchairs. Each group also had the opportunity to assemble Rough Rider wheelchairs with explanations that this type of chair was most appropriate for more difficult terrain with its heavy-duty frame and bicycle tires. These actual demonstrations help wheelchair users to become informed consumers, and promotes end user confidence toward self-advocacy regarding future wheelchair procurement. Growing up in Gharm with his four sisters, Khisrav liked playing soccer & volleyball with his friends. Today he is married with two sons and a daughter. He works mainly around the house, and is pursuing his love music. His goal is to become a musician (right), singing and playing keyboard professionally. Below he is pictured with his mother during an Interview with Polus Center executive director Michael Lundquist (far right) and field officer (center right) Santiago Castellon .